DNA from the Beginning is organized around key concepts. animation, image gallery, video interviews, problem, biographies, and links. Hibernation - Why Not Me? 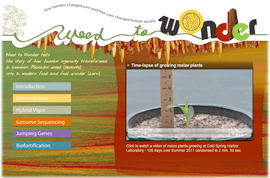 We have relaunched the Weed to Wonder site as a flexible "e-book" that can be viewed as a website, an app, or a printable PDF. Sign-up to receive email newsletters on dnalc resources and educational opportunities! - Has a second person with HIV been cured?